Ford has joined the Daimler-led simTD V2X project in Germany, a car-to-car and car-to-infrastructure communications testing project involving 120 vehicles overall. Back in April, I made springtime predictions regarding automotive's future. As predicted (HA), most of you have forgotten about what I said would be coming. Well, Prediction #3 is getting closer. Ford has joined Daimler and others in Europe in a massive vehicle-to-vehicle and vehicle-to-infrastructure communications test project that takes Volvo's Road Train idea to whole new levels. Ford is contributing 20 vehicles to the 120-vehicle project called simTD V2X (vehicle-to-X). 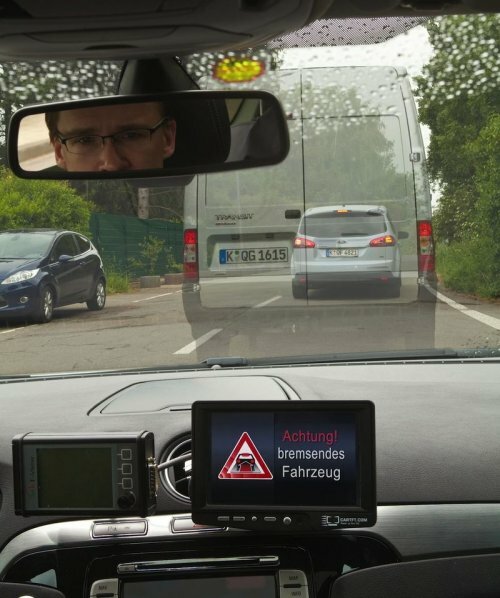 Twenty experimental driver assistance technologies are being tested in the project and the goal is to better understand the potential for car-2-car and car-2-infrastructure communications in improving traffic safety and personal mobility options. Ford joins the project as part of its internal Blueprint for Mobility, which was outlined during CEO Bill Ford's keynote address at the 2012 Mobile Word Congress earlier this year. The Blueprint looks to tackle the issue of mobility in an increasingly crowded and urbanized planet from now to 2025. Up to now, the simTD project partners have been testing the V2X developmental technologies in controlled environments. Now, the team is moving forward to public testing on roads in and around Frankfurt, Germany to assess them in real-world driving conditions. Some of the tech being tested is very far out there in terms of what we can imagine vehicles being able to do in the near future. The above graphic is an illustration of how an Electronic Brake Light works. Despite the lead vehicle being hidden behind the large delivery van, the car behind the van "senses" the emergency braking of the lead car. So even when line-of-sight is not present, the cars can communicate (whether in a "Road Train" or not), allowing future vehicles on the road to "talk" even if not necessarily linked together. An Obstacle Warming System works similarly to the EBL, but concerns objects in the road that drivers may have swerved or maneuvered to avoid or that were sensed by radar or other in-built safety systems. This information can be communicated to other vehicles behind, giving driver alerts to improve safety. Traffic Sign Assist is another interesting one. This involves infrastructure and allows traffic signs, controls, variable speed limit signs, etc. to communicate to vehicles directly. This would let navigation systems alert drivers to changing conditions, allow cruise control to change speed automatically to comply with changing limits (say through construction zones), etc. These are just some of the 20 technologies being tested in the simTD project. Turning stateside, Ford has been conducting ongoing testing of similar tech here in the U.S. In 2004, Ford partnered with the Minnesota Department of Transportation to equip state vehicles with sensors to collect traffic-related data in order to develop next-gen driver information systems. More recently, that culminated in a multi-city tour of intelligent vehicle communications tech in 2010.